Description: Q335-15 heads through Alto towards GR. Description: Q33515 in the morning sun at the turn of the Century Mill at the East End of South Lyon. Description: Q335-15 soars past the East End of South Lyon at Track speed. Description: An acid train swings south towards Lima at Deshler with a colorful lashup. Description: UP’s MLIEW-12 (Manifest Livonia, La-Englewood Yard Houston, TX) with an AC4400CW heads west. Description: Dropping down the hill at MP 590.5 is MNA Train GSJDKN 08 with Engineer Bob Plough and Conductor Mike Hickman. When the train gets to Nevada I'll get on it and take it south. Description: Sitting at the top of John Deere Hill at MP 530 on the MNA Nevada sub. is MNA Train GSJDKN 08 with 4 engines on the point and 75 loads and 2 misrouted empties. We held up here waiting for the Carthage Day Switcher to clear up before we proceeded on down within Yard Limits. Description: Manifest Train departs Gateway Yard as it rolls by a set of yard power. Description: UP AC4400CW 7247 leads a stack train east through Downers Grove. 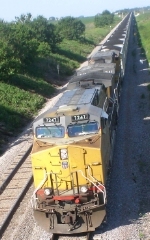 Description: Second Unit on the ballast train.